This is becoming a tradition now, and something I thought I would like to share. 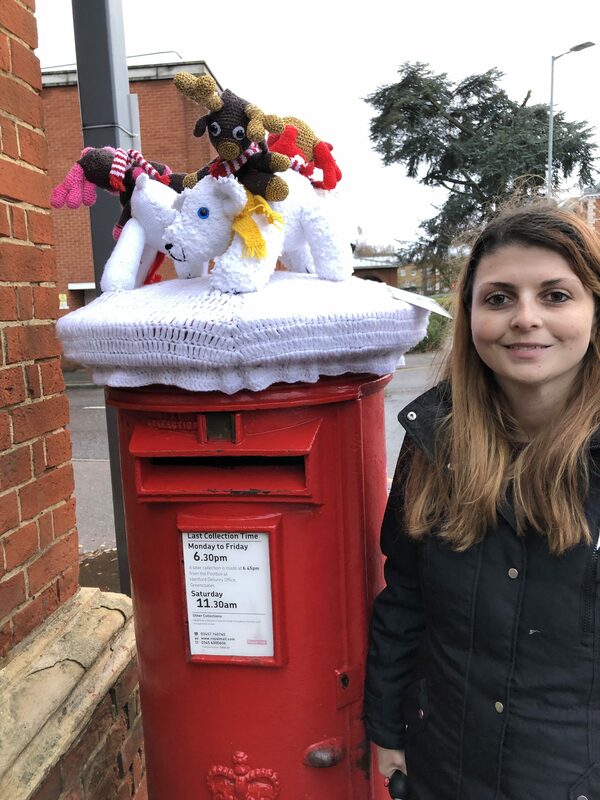 The majority of people give at Christmas, send presents and cards to friends and family and what makes sending cards more special at Christmas, is that a local group of secret crafters from Hertfordshire, UK, get together and create yarn bombs to cover postboxes throughout Hertford. They are all in aid to raise money for the Isabel Hospice. But aren’t they just the best way to share Christmas cheer and putting a smile on someones face. 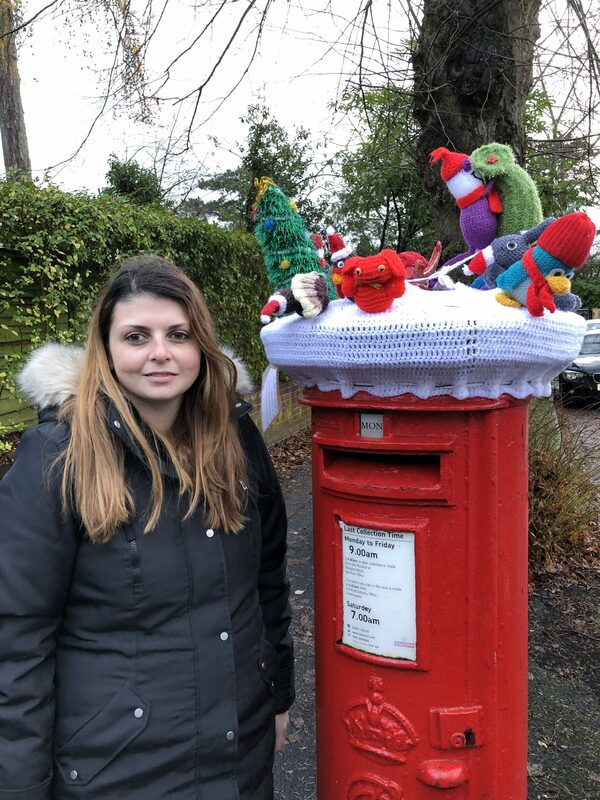 In total this year there are 29 postboxes yarn bombed and I was lucky enough to find 24 to share. 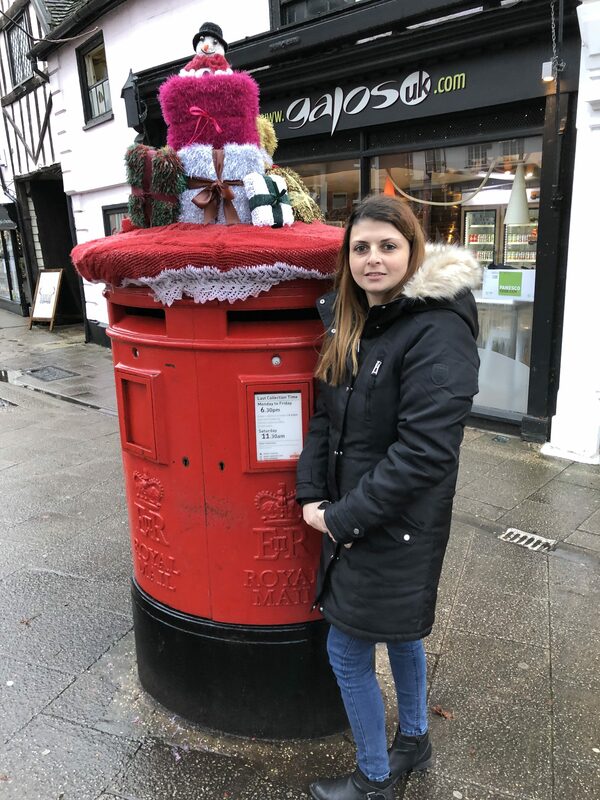 The real shame is that not everyone respects these festive covers and two were vandalised. Which is a real shame. One because of the hard work and effort these crafters put in and secondly because they are all for charity. So here are the 22 I have found and want to share. 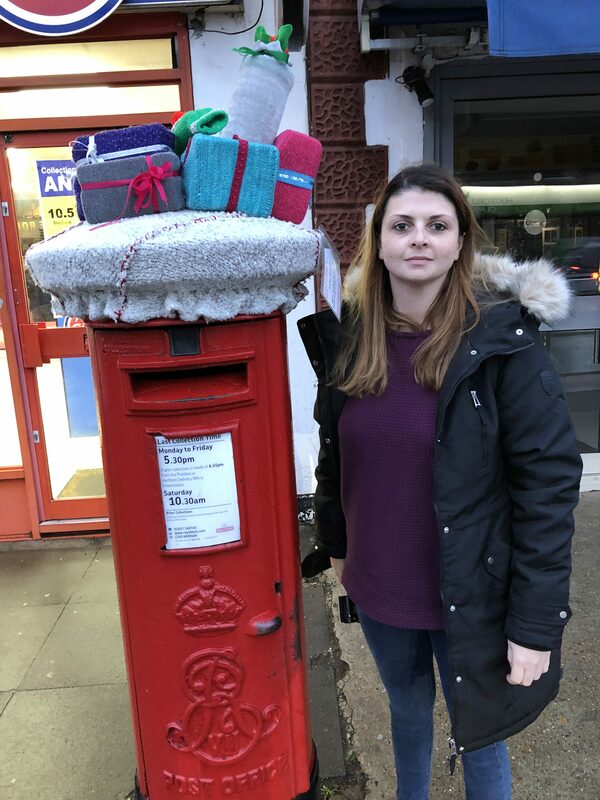 The first post box we found was this one. 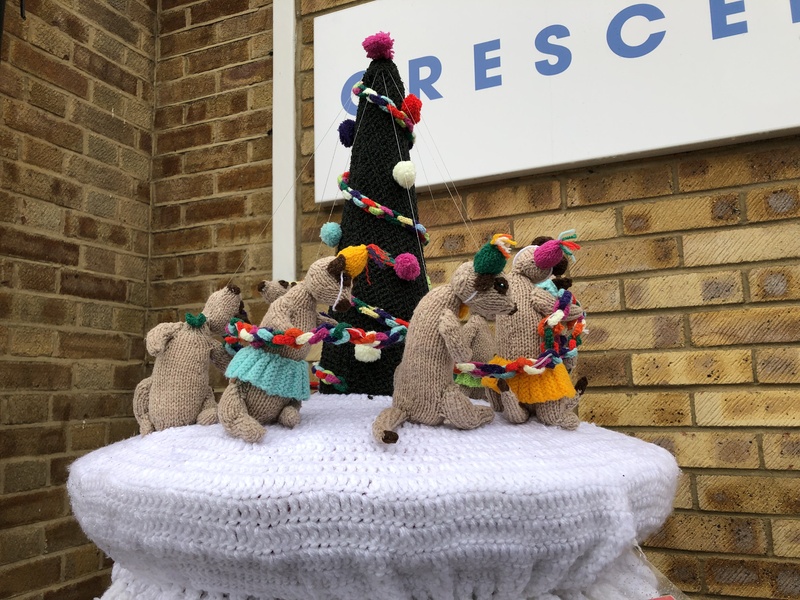 How cure are the meerkat’s walking round the Christmas tree? These even from photograph you can tell how well made these are. I love the pom-pom decoration on the tree. Even if it was raining when this was taken the still look amazing. It’s not just the front either. 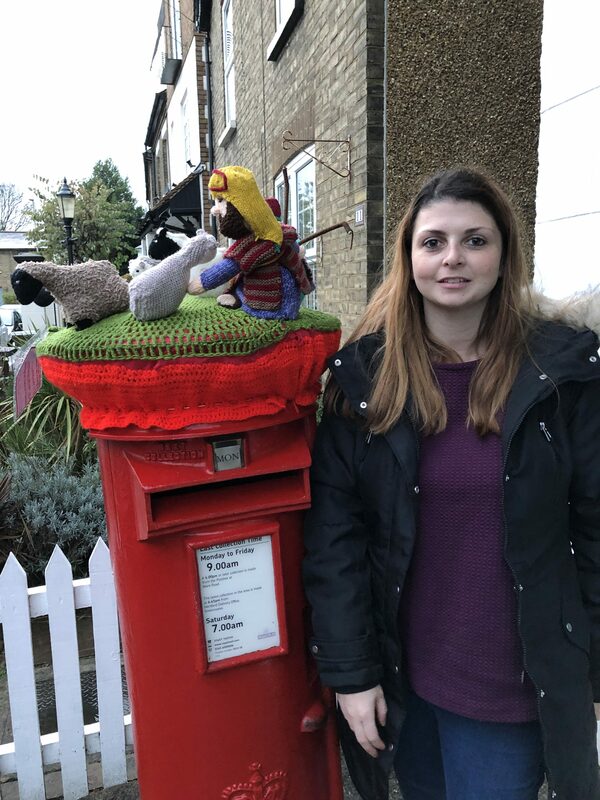 I walked the whole way round the post box and the meerkats followed. It looks like they are decorating with paper chains. I love how the lady meerkats have skirts on too. I love this one too. 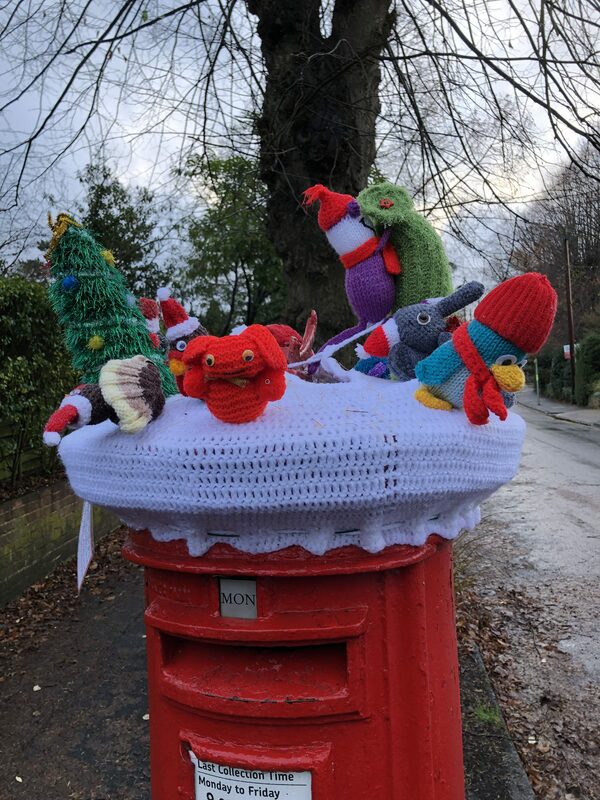 I love how all the birds are knitted together and sitting round the edge of the post box looking out. With the lantern lights hanging round the edge. I love how bright and cheerful it is with all the colours used. 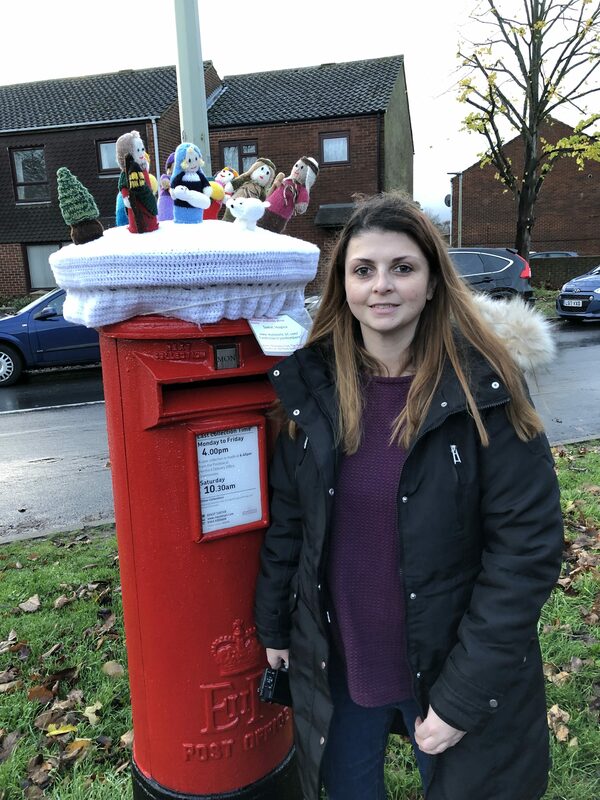 Its really cool as well to see so many different designs and ways to decorate a post box. Gingerbread is really on trend this year. A lot of fabrics are gingerbread themed and lots of quilting and crafts I have seen are very much there this year. I love this one. Its just face on featured. 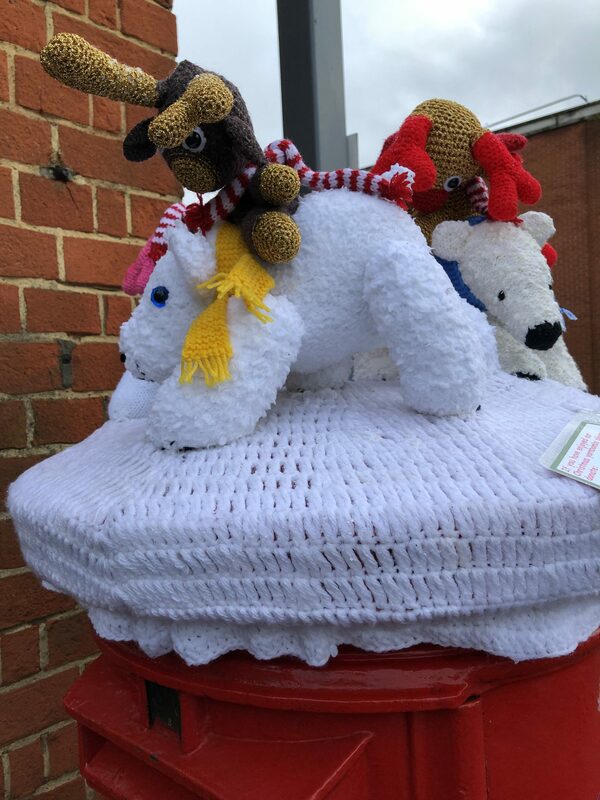 I guess if you went round this post box you would just see their backs but its so cute. 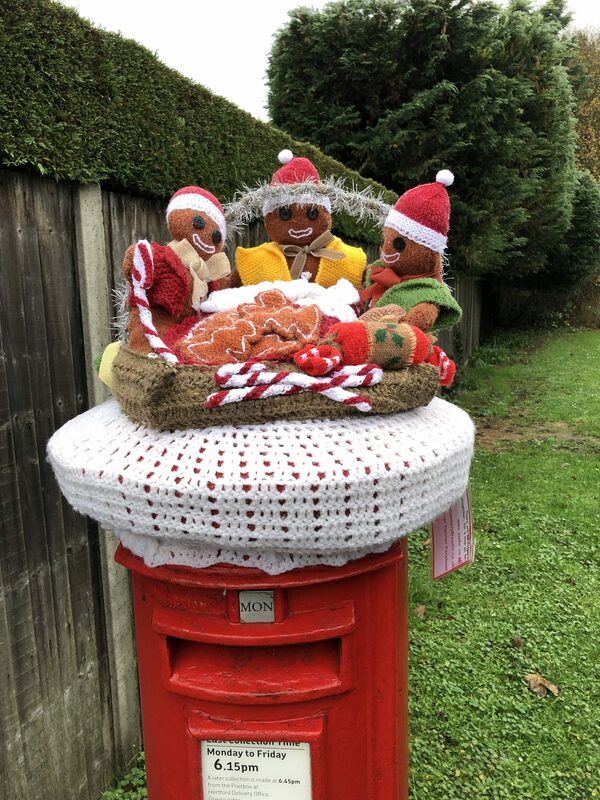 I love how they are holding a basket of gingerbread themselves. All Christmasy with their Santa hats on. 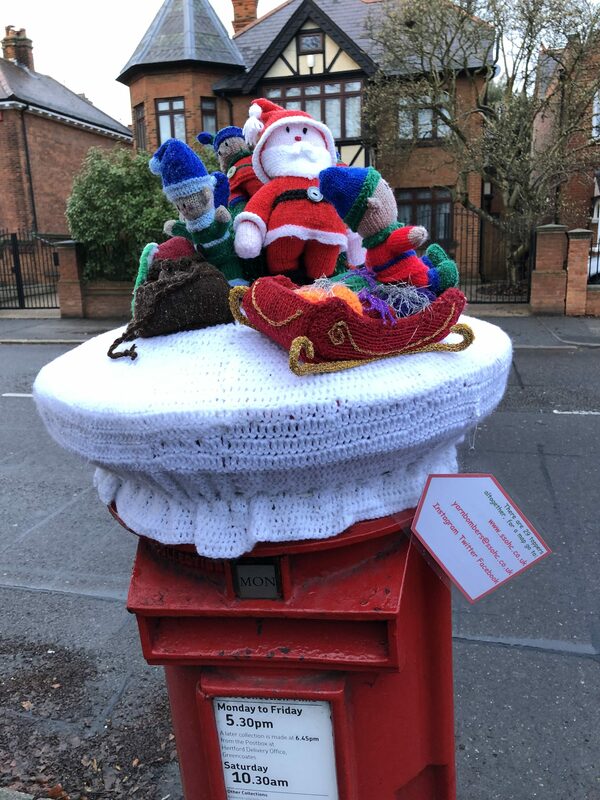 There are a few post boxes around with the yarn bomb including Christmas presents but they are all unique in their own way. 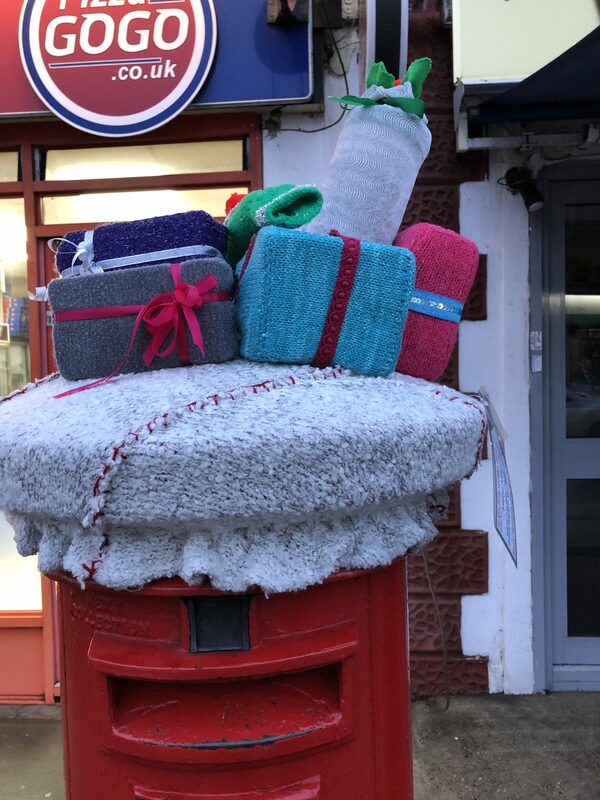 I love how the snowman is just peeping over the top of the presents. Its also good that the presents feature the whole way round so whichever way you look at the box It has presents with bows on to look at. 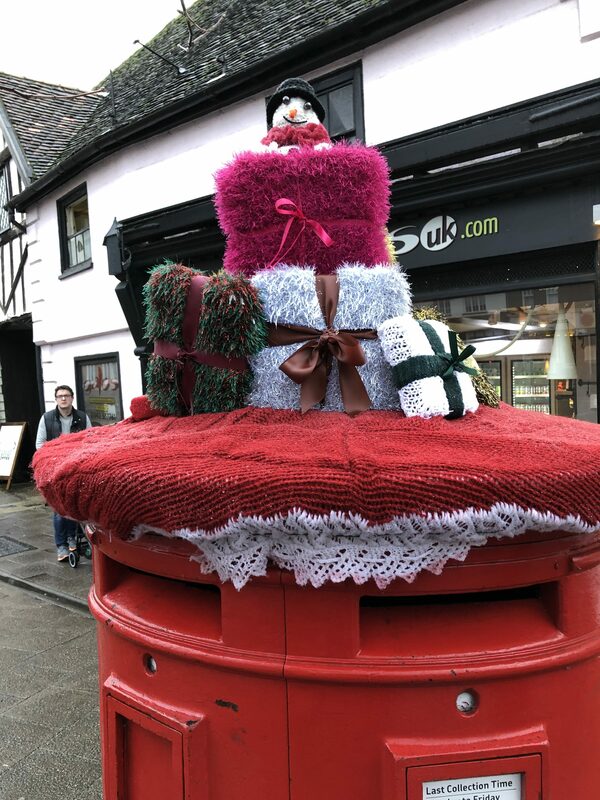 This one doesn’t have the white base but has the lovely Christmas red and what looks to be like lace but made from yarn. This one has to be my favourite. The children’s classic the snowman. Who doesn’t love that film! I love how all the characters are grouped together and are different textures. Doesn’t the snowman look like a snowman. Far less cold though to hug I imagine. Though it was raining the day I went on the hunt. Even though it was raining look how well it still looks. 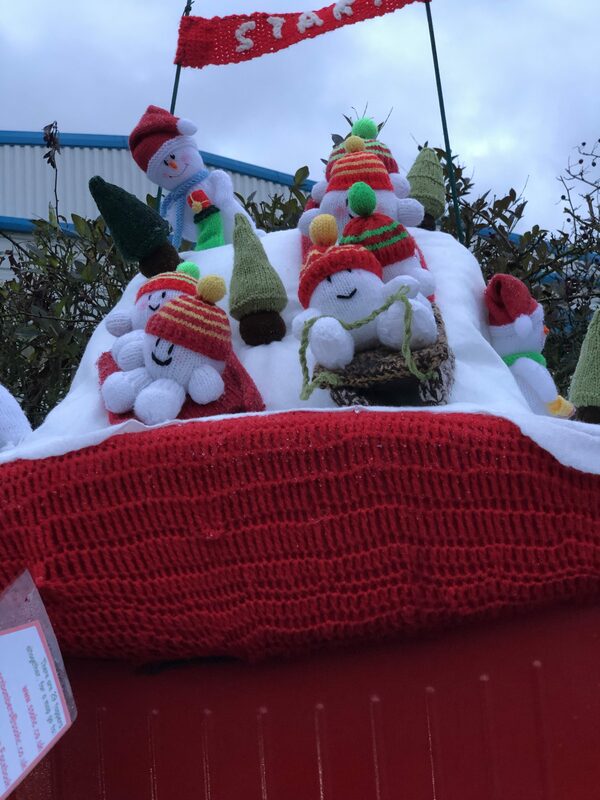 All characters standing correctly and the rain hasn’t ruined the display. This one makes me laugh. 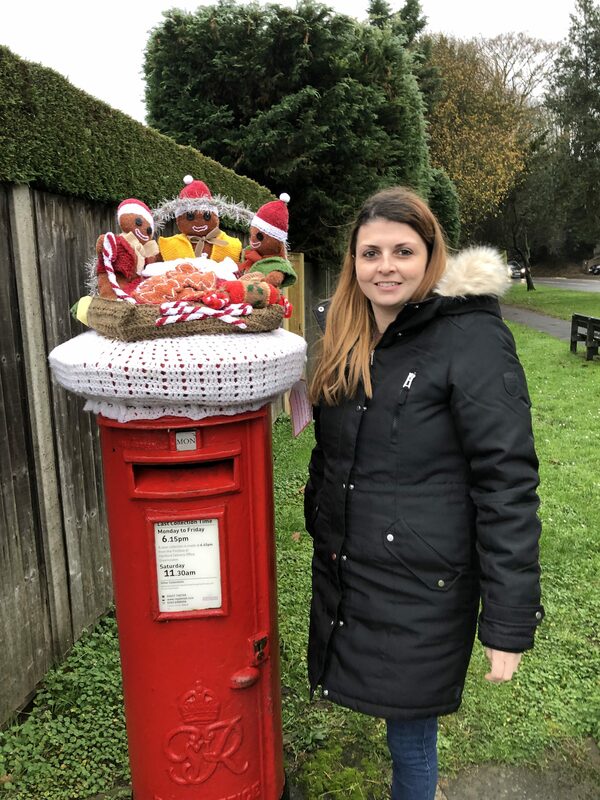 Christmas dinner with a post box for a plate anyone? Look at those brussel sprouts with the goggley eyes! Again I think this is a fun idea and unique. One that will definitely make you smile when you post that card to your loved ones. I love the Christmas cake at the back and the Yule log. The facial expressions on all the food just makes me laugh. This definitely is spreading Christmas cheer. I love the textures they have used for Santa. You can see the fluffy yarn is something you would associate with Santa. The frogs are so cute in front as well. I like how they have used different greens to add colour and make them a little different. Of course the turkey is hanging round on the side. 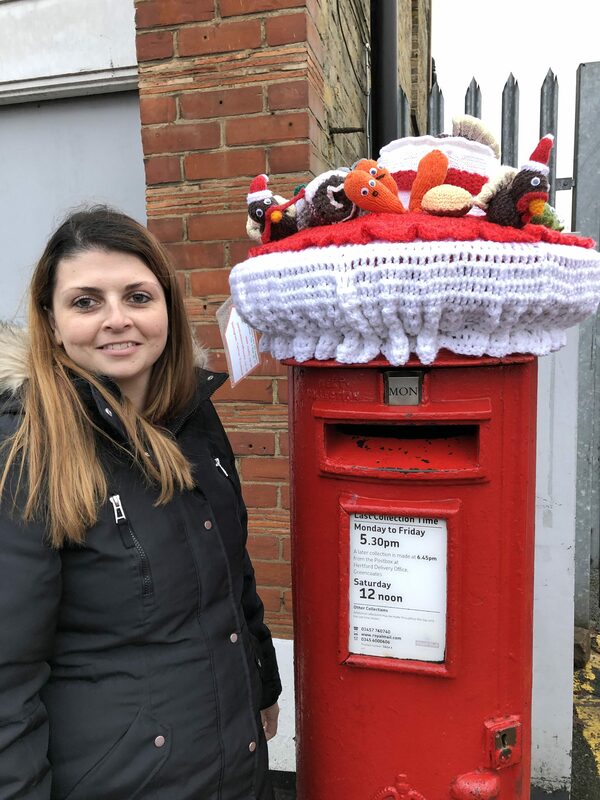 Turkey’s are one of the most common things to see on these post boxes. The Christmas tree reminds me of a cactus don’t know why but he looks Mexican. Do you see what I mean? This one is more cartoon like to me. The snowman attacking the tree is funny. 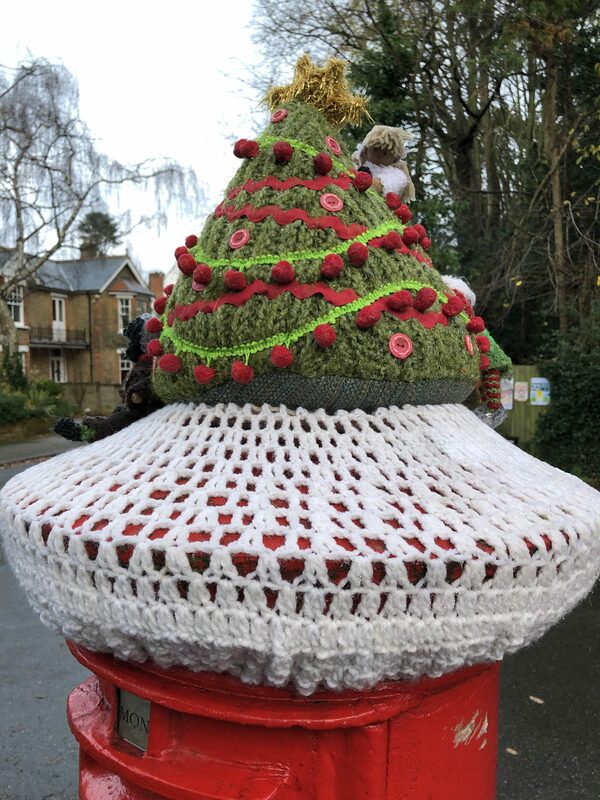 I love the texture of the other tree, with the yarn having the tinsel in to add the look of a real tree. Lots of turkeys on this one. The animals round the edge are cute especially the elephant. This has to be one of my favourites too. I love the big Christmas tree and all of its embellished Christmas decorations. I love the buttons and the pom-pom chain makes me want to go put that on my own tree. You can see what looks like to be an angel at the top, but in fact there are a few nativity members climbing the back of the tree and sitting round the side. This is why its good to see in person to see all views if not check out my video. 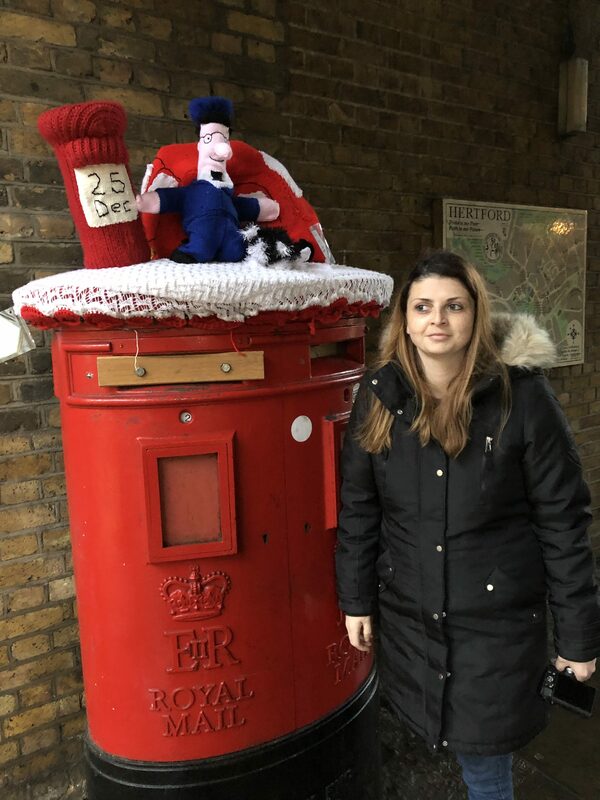 Postman Pat used to be one of my favourite programmes as a young child. 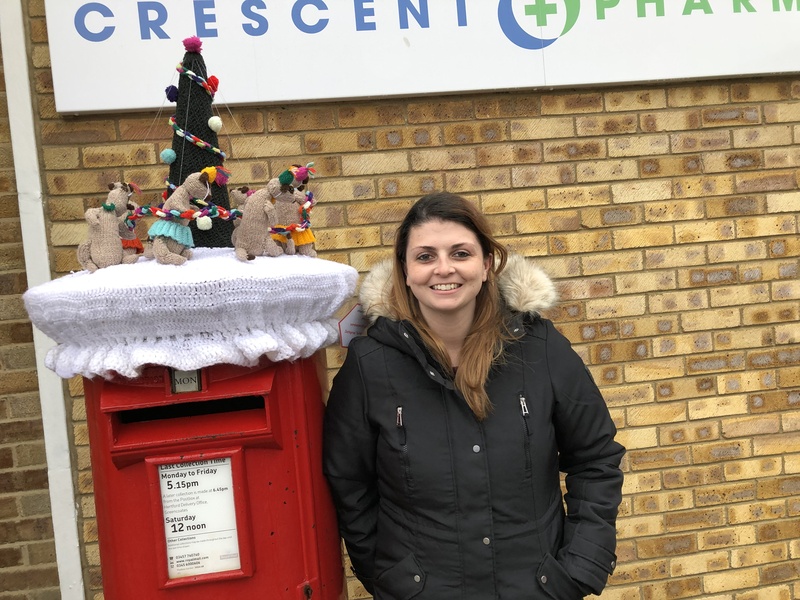 Though not typically Christmas it is something most people recognise. 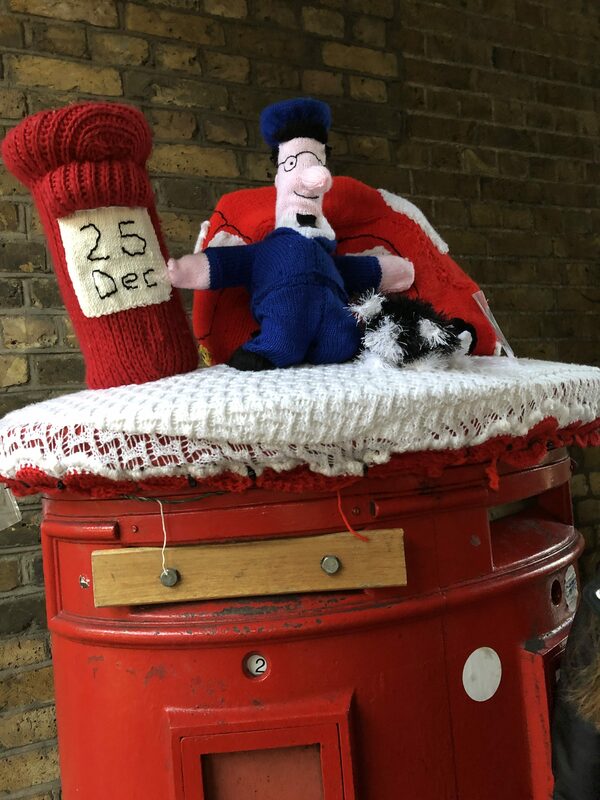 It sits just outside the old post office, so a postman theme is good. 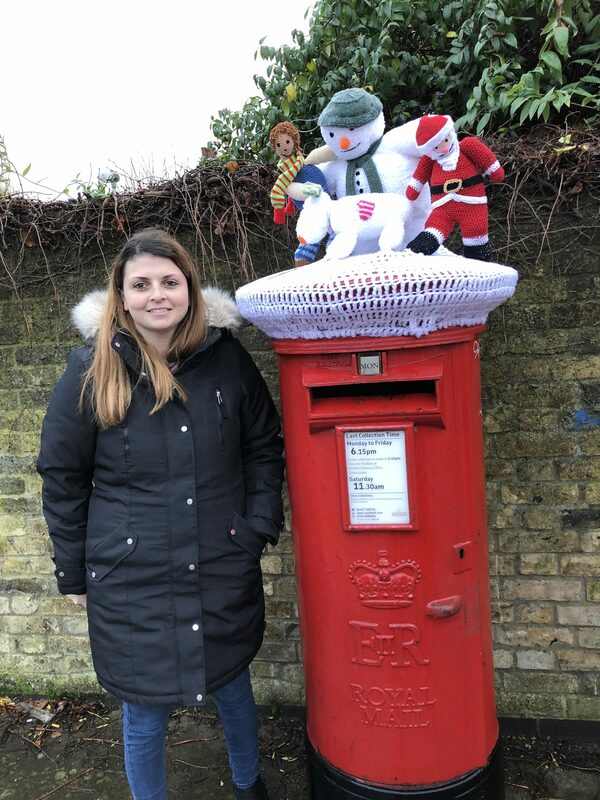 The date on the yarned post box of course reminding us its for Christmas. Again I love the texture of Jess the cat and how it makes it more real life. I love this one, I love all the different polar bears round the bottom, how they are all slightly different in texture or features. I also smile to see they are all carrying reindeer. Again its putting a smile on my face spreading that Christmas cheer. This one has a typical North Pole look. You can see all the elves helping Santa to get all the presents ready for all the children. I love how detailed this is. The string hanging down from the sack. All the elves piled in behind Santa. 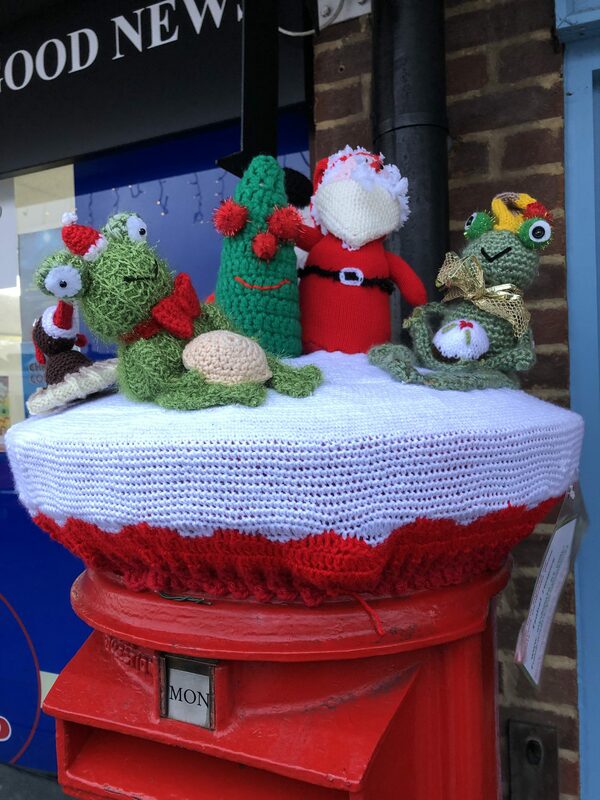 Each elf being slightly different in colour adds the bright and festivity to the post box. This one to me has less to it than the others. Its still good but the other present ones seem to have more layers to it. I love the Christmas puddings round the edges though they are cute and cake pop size. Very realistic in detailing. This has to be one of my favourites as well. Penguins are one of my favourite animals and I love how they all have different hats and scarves on. 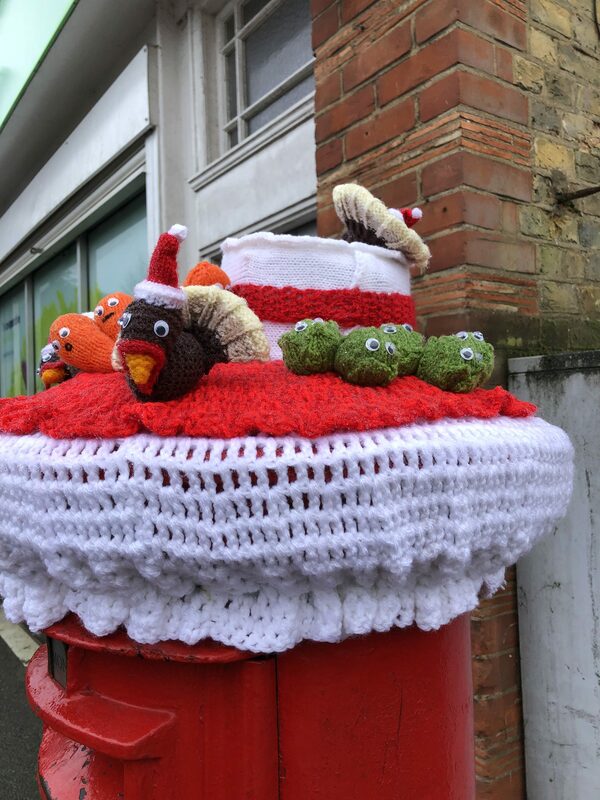 I love the colouring to this one and the tinsel fringe around the bottom. The tree looks furry with I guess can symbolise the branches on a real tree. Again the pom-poms are making an appearance and I love them. 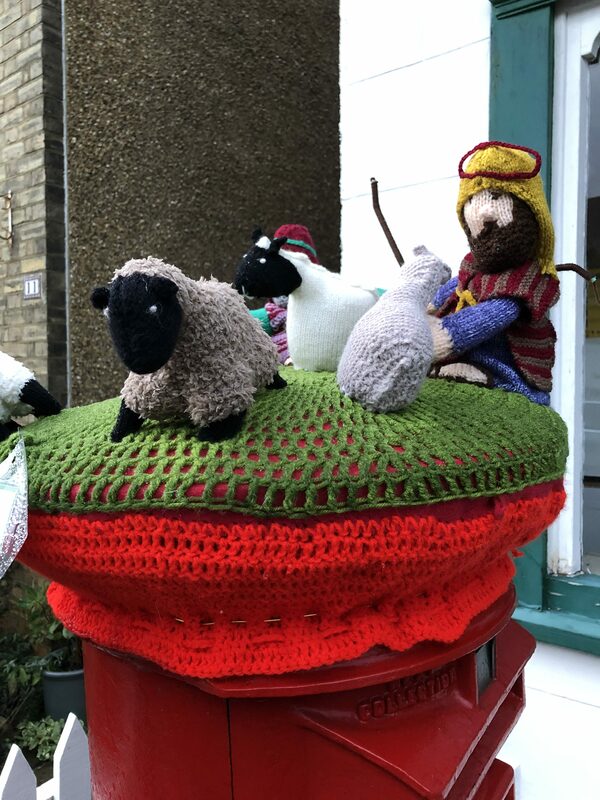 This post box is inside but I love the felt base with the lantern lights dangling off. 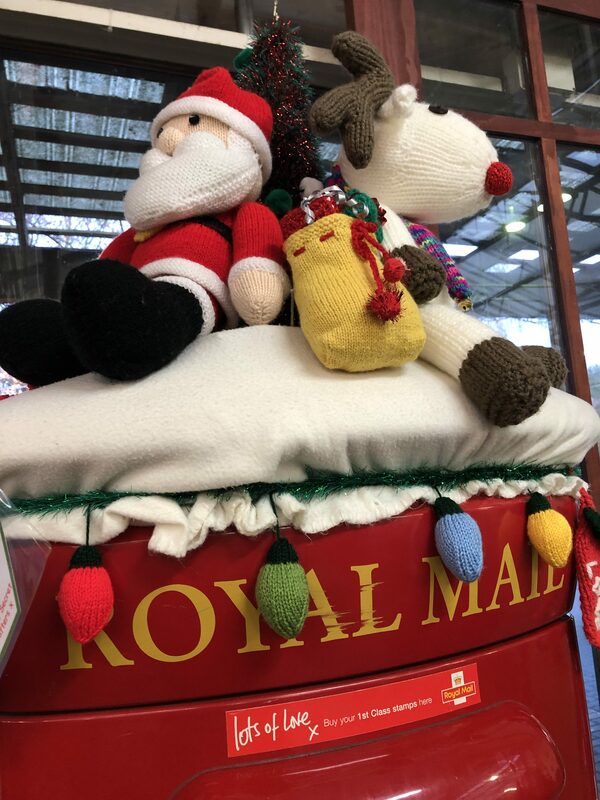 Then Santa and Rudolph sitting proudly on top. 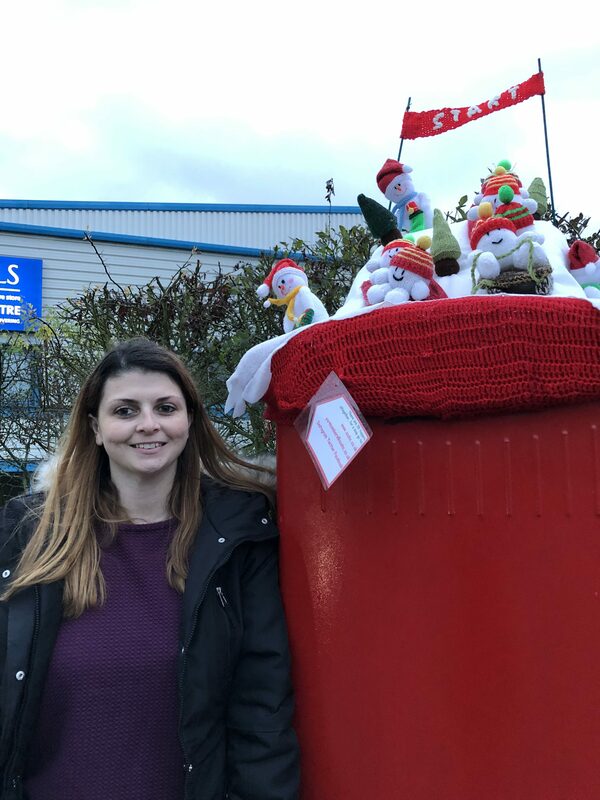 This one is in the local garden centre where I as a child use to go visit Santa himself. Imagine walking out of the shop and seeing these. All those children’s faces smiling away at Santa and Rudolph. I love how this one is the Nativity and shows the real meaning to Christmas. Its essential to have a or many featuring some or all the nativity characters. 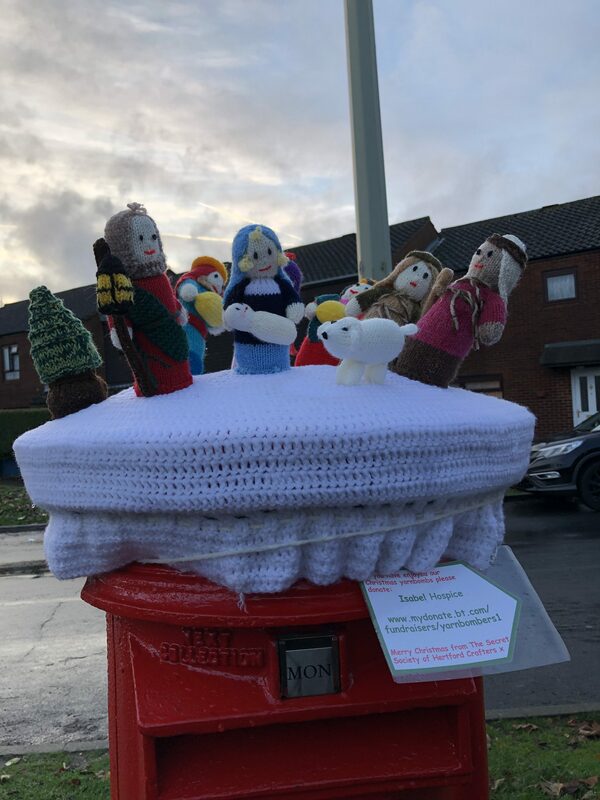 Again this is really good because you can look the whole way round the post box and see the features of the people clearly. This one again is really good, part of the nativity showing the Shepard with his sheep. I love how the sheep are all different and I love the green coloured yarn for the grass. 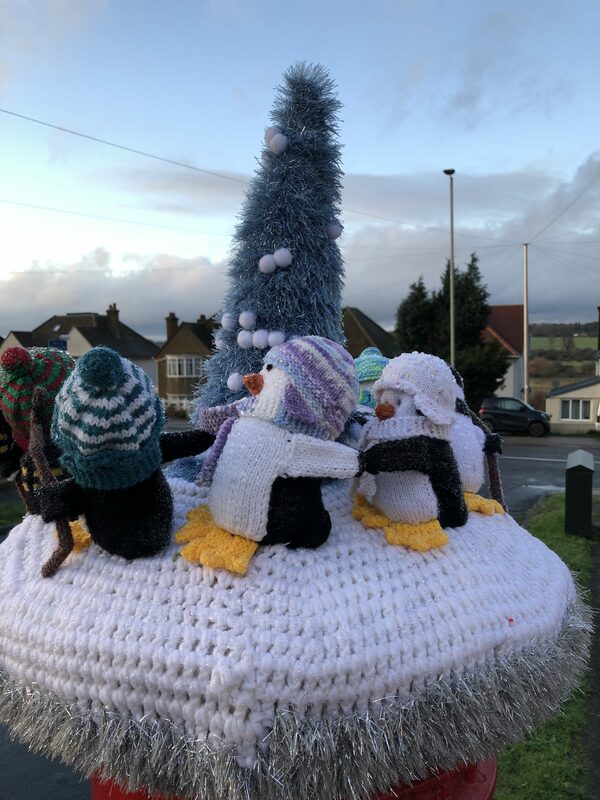 The added colour adding more smiles and brightness to the festive season. I love how the presents are all in bright colours with bold ribbons and bows. I also like the fact that they are piled up so it adds more to the box than being just flat on. I think the different shaped presents are cool too. Adds that little bit more excitement and even I at 28 want to know whats inside a present even though these aren’t real. 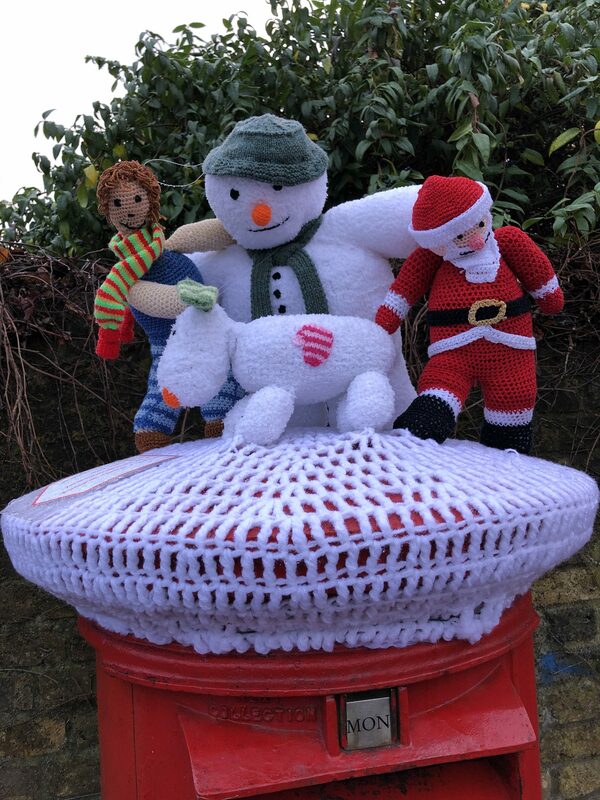 This one is situated outside a fire station hence the fireman and the chimney. I love the mesh fabric creating the fire out the chimney. Who doesn’t love an open fire to warm up by? 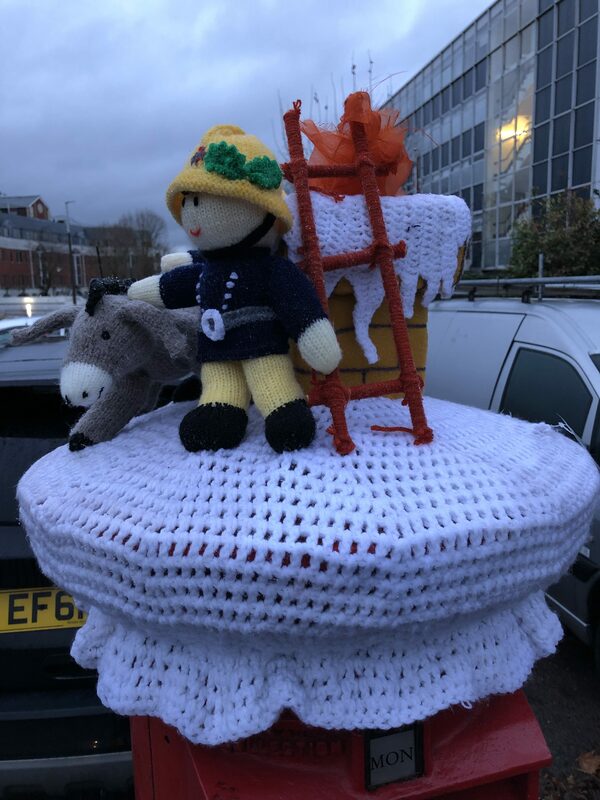 The donkey on the side adds the nativity in to the yarn bomb, adding the Christmas feel. This one is really fun! Snowballs going skiing. How fun. This one makes me laugh, its so cartoon and child like. Like a dream I would of had when I was little. A bit like Toy Story where the toys are alive. 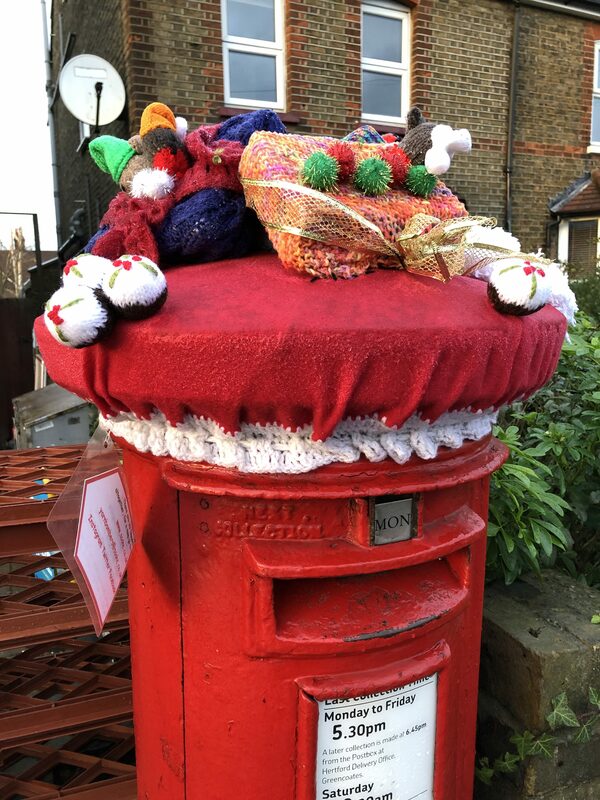 I love the different fabrics and yarns used to create this fun festive box. This one I didn’t find but my friend and pilates instructor did. 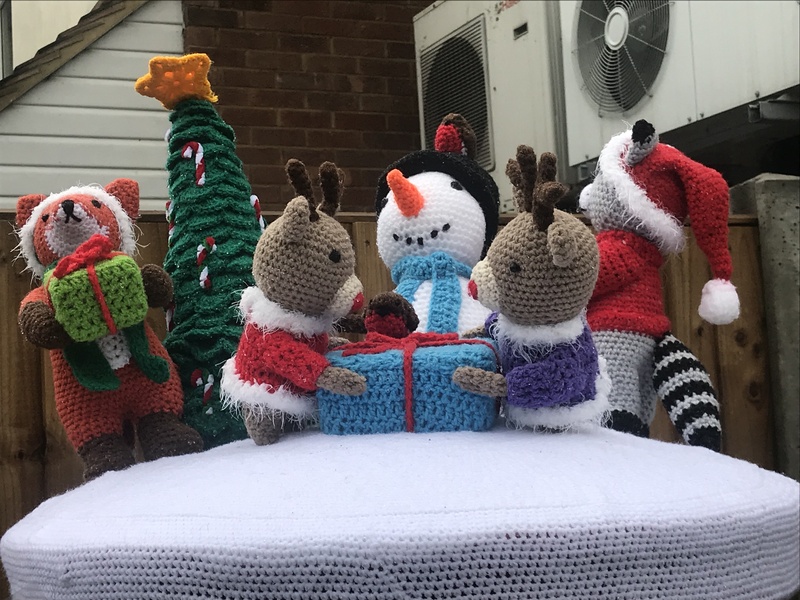 Its all crochet and how cute is it? I love the candy canes on the tree and all the animals giving gifts to each other and the snowman with the little cute robin on his hat. Its just cute and fun to see. 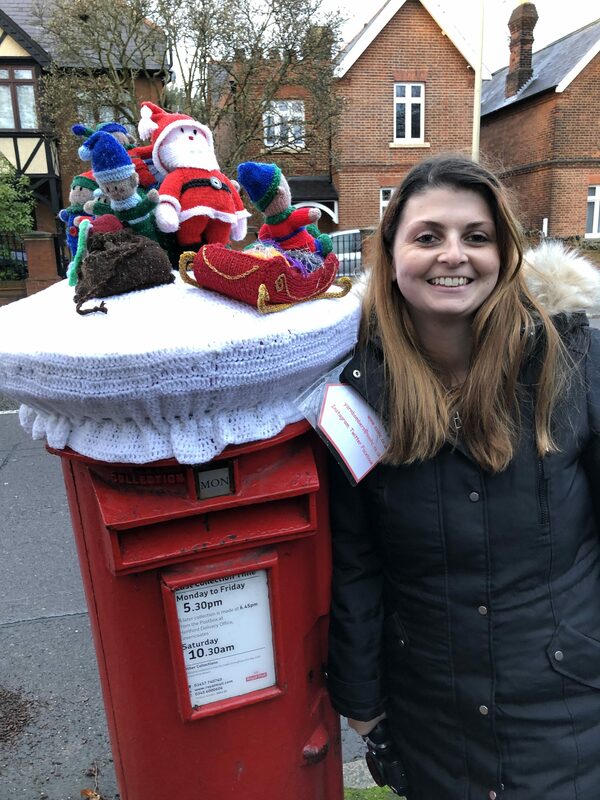 These are all the post boxes I have seen so far. I hope to find more but if you would like to see more then please do feel free to visit their Facebook page. I also ask if you could spare any chance and donate to this great charity. 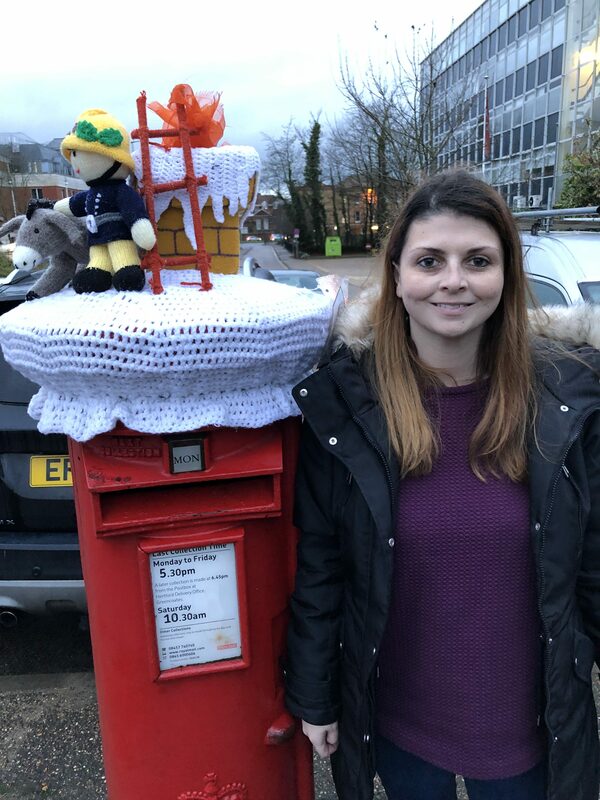 Out of all the post boxes I have shown you which is your favourite? 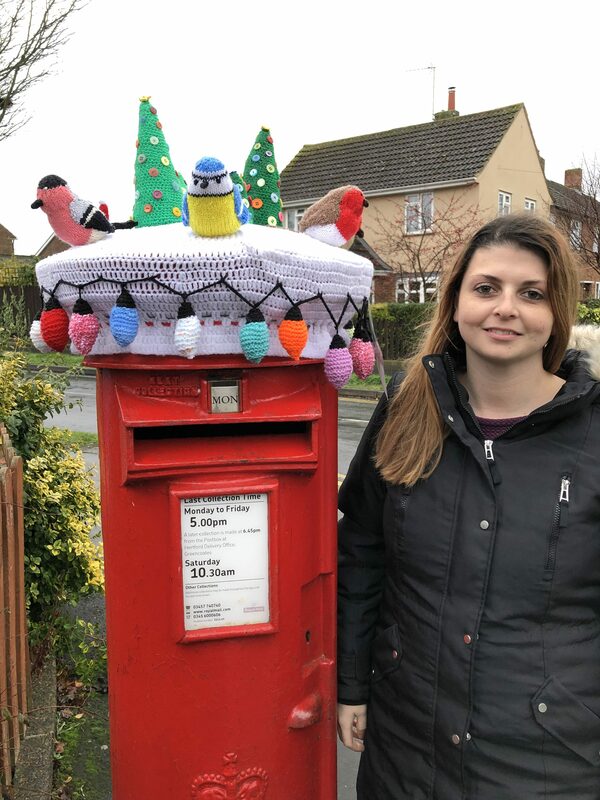 Does your local town do anything like this?